The Internet Bible Catalog is a web-based catalog of printed editions of the Bible. 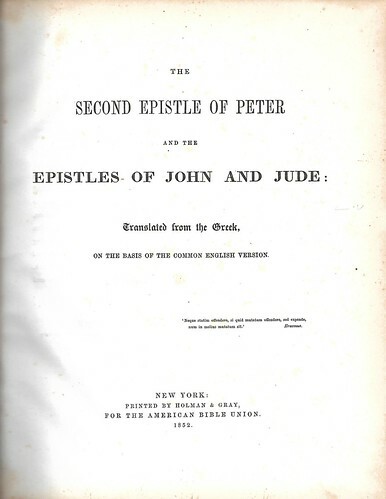 Its primary focus is on English language translations, but it has many entries for Bibles in the original languages and in non-English versions. The Catalog welcomes participation from the larger community of Bible Collectors. Members are encouraged to add and correct entries. The Internet Bible Catalog is different from printed catalogs in that it includes images of the Bibles. For almost all entries, the title page is included and many entries include covers, jackets, or representative pages. Another unique feature is the inclusion of sample verses; a representative sample of verses from a given version. The Internet Bible Catalog is constantly changing and growing; new translations are added on a regular basis and information on older versions is also being added. New Feature Bible Timeline The Bible Timeline presents Bible translations in chronological order beginning with Wycliffe in the 1380 and going right up to today. Entries include links to other pages on the Internet Bible Catalog so you can quickly get information on the translations. This is a continuing project and not all translations on the Internet Bible Catalog have yet been added to the timeline. New entries are always welcome and information on entering a new version can be found on the new entry page. The site also features a search box located in the upper right hand corner of every page. Try typing in "Moffatt" or "King James" to see how the search function works. There are many wonderful sites of the internet that specialize in Bibles and Bible collections. One organization that encourages Bible collection is the International Society of Bible Collectors. Check out our page listing current research topics. Share your research interests and expertise with the wider Bible collecting community. A Forum has recently been added where people can comment on the site. Please see what has been posted and share your thoughts and ideas. Just click on the Forum link at the top of the page to get started.